Home » Startups » Econet’s EcoSchool to launch tomorrow. What you should expect? Econet’s EcoSchool to launch tomorrow. What you should expect? We just received an email from Econet inviting us to the launch of EcoSchool. But EcoSchool was launched 8 months ago, we can hear you say. That actually was a pilot launch. Just a really big one. The pilot was supposed to last 4 months but clearly ended up eating up double the time. According to the email today though, the pilot was successful and EcoSchool is going full steam now – “nationwide”. 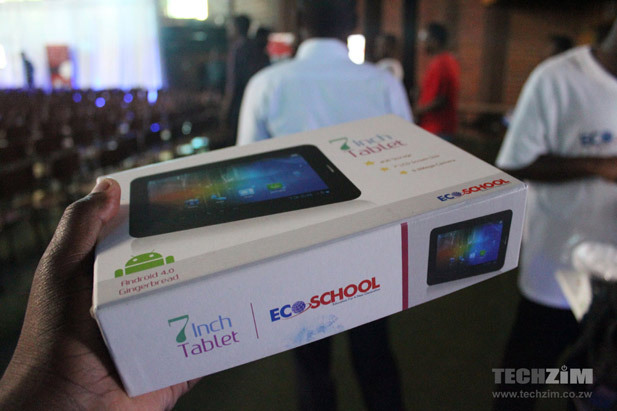 On what exactly EcoSchool is, the simple description is: a tablet that gives students monthly subscription based access to a tablet of ebook versions of college curriculum books. The subscription a month is (was in the trial) $5. All this could ofcourse change tomorrow when they announce the EcoSchool after 8 months of iterations in the model. The EcoSchool that launches tomorrow, and what the 8 months has been in numbers and lessons, will surely be interesting to see. There are things however we think EcoSchool should have when it launches. And top of that is accepting that the opportunity of the internet is in ordinary people not needing to be registered at a brick and mortar college to need to benefit from education. EcoSchool could become a MOOC resource for anyone with EcoCash if it’s not restricted to institution registered students. In fact, EcoSchool could be an opportunity for any Zimbabwean to study the material at local universities that, for one reason or the other, they were not able to access without EcoSchool. We also think EcoSchool can be more social. Students, for example, could coordinate physical book exchanges for all the content that can’t be found on EcoSchool. EcoSchool will not have all the material, better make it useful therefore as a platform to find physical books. biNu already had some social features the last we checked, and maybe Econet can take advantage of these. Social could also be used to annotate text in books to discuss it with the study group but maybe that could also complicate things unnecessarily. The last time we experienced biNu, the experience wasn’t as smooth as that that you get when reading offline PDFs. Pirated ones yes, but still that is the competition Econet is up against. It’s ok that EcoSchool books require you to be connected to the internet since Econet is supplying the internet, but that experience has to be smooth. What happens when I’m reading a chapter and for one reason or the other, my 3G won’t connect? I wait 5 minutes to just open a page? Offline PDFs are clearly better in that scenario. You download once and you ‘own’ the book. They could also introduce group rates for when a group of friends (again, social) would like to group buy. If you have been in on the pilot, or just had the opportunity to use the tablet, please do share your experience in the comments. What would you want and expect to find in the launch tomorrow? ZANU PF dabbling in banking and e-commerce? Congradulations ecoschool. Limbikani I wish one day you launch a product. It would be nice reporting about about your product. Hope we will be partial as you are always! The grammar that was used in this article made it the article more tedious to read. Great topic but would have preferred it if the article was clearer and more concise. In this day and age where blogs are quite a popular way to reach an audience I believe you should make sure you proof read your articles and try and make them as professional as possible. How mch are these Tablets going? Are they affordable for the Average Joe? its econet ,if you have three arms and can spare one yes..